Our office is dedicated to serving you. We pride ourselves on our customer service and will give you the best experience when in our office. Call us for any of your car insurance, homeowner's insurance, business insurance, or life insurance needs. STATE FARM IS THE #1 AUTO INSURER AND HOME INSURER IN THE NATION. We insure more cars than our next three competitors combined! 24 HOUR “GOOD NEIGHBOR” CLAIM SERVICE. Call our toll-free number from anywhere, anytime. No voice recordings. You’ll always get a live, friendly person! EXPERIENCE. We have over 20 years combined experience in insurance and financial services. ADVICE AND SUPERIOR SERVICE FROM LOCAL PROFESSIONALS. We pride ourselves on providing quality service our customers have grown to count on! CONVENIENCE. We are open Mon - Fri from 9:00 to 5:30, and Sat. from 10:00 to 1:00. Corey LeJeune is a Lousiana State University graduate with a Chairman's Circle Qualifier and an Ambassador Travel Qualifier. He has a passion for helping people with their Auto Insurance, Home Insurance, Renter's Insurance, Life Insurance and Health Insurance. He is a proud resident of The Woodlands, TX and a member of the South Montgomery County Chamber of Commerce. 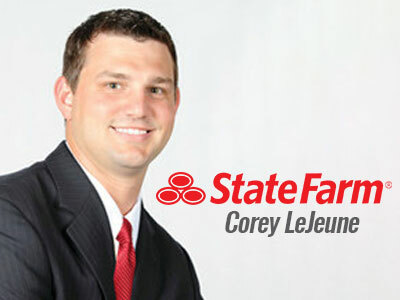 Corey is also a devoted husband and proud father, he takes pride in helping families attain peace of mind with Statefarm. Should you be paying less for your auto insurance? Click here to get started with your FREE quote today! CONVENIENCE. We are open Mon -Fri from 9:00 to 5:30, and Sat. from 10:00 to 1:00.